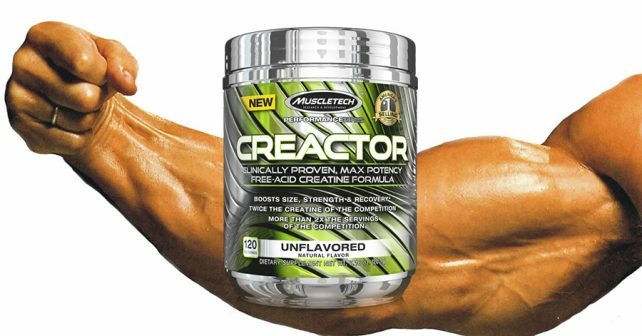 Creactor by Muscletech Review – Should you take it? You can always count on MuscleTech to release the most intriguing product names in the business. MuscleTech is one of the most well-known supplement brands in the market today, and is responsible for products like CreaCore, Phase 8, and Anarchy. Like how many big-name brands do, MuscleTech is always adding new product names to its arsenal. Creactor is MuscleTech’s new brand of Creatine supplement. This is not to be confused with CreaCore, another product of MuscleTech, which contains Creatine as well. The most striking difference between CreaCore and Creactor is its added ingredients. Creactor contains 750mg of Free Acid, while CreaCore contains 450mg Fenugreek extract per serving. Creatine is an important supplement in bodybuilding. It does two major functions in muscle supplementation – it improves muscle strength and it enhances muscle endurance. Creatine is meant to be taken as a post-workout supplement to replenish lost nutrients during workouts. Just like CreaCore, MuscleTech markets Creactor as a double-strength concentrated creatine formula that should meet your daily creatine needs. Products marketed by big-name brands are typically sold in stacks. Those who purchase Creactor are those who have probably bought into one of MuscleTech’s other products. There are a lot of creatine products in the market, with most offering very little variety aside from the traditional pure creatine formula. When we usually talk about creatine supplements, there’s nothing much to do but evaluate how much creatine is in the mixture and be done with it. With Creactor, it’s a little bit different. It introduces “free acid” creatine in the discussion and most of the people buying the product do not really know what it is. Free acid creatine is supposed to be the purest form of creatine. Taking free acid creatine ensures that you absorb the most of the creatine that you’re taking. In the Creactor formula, 50% of it is free acid creatine, and the other half is Creatine HCl. According to MuscleTech, this mixture of 750mg Creatine Hydrochloride and 750mg Free Acid Creatine is the best muscle building supplement mixture of creatine, but we beg to differ. After all, creatine is creatine. As long as you take 3-5 grams of it per day, you’re all good – even when you take 3-5 grams of creatine monohydrate (the cheaper creatine), it’s okay. You won’t be losing anything. Compared to other forms of creatine, Creactor is more expensive gram-for-gram, despite claiming that it has more servings per tub. The way I look at supplements is simple – is the difference worth the price? Sure, Free Acid Creatine may be better, but is the difference really worth that much money? In this instance, it’s not. Unless you run the thing through a lab, you wouldn’t notice the difference. I say, if you have the money to spare, spend it on the best supplements for muscle gain like NitroGenix 365 for better results.